There is still chance to save money at G.H. Bass & Co. Factory Outlet Locations in the U.S. and online. Get discounts up to 70% from original retail prices. 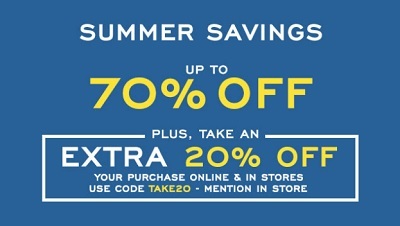 Plus, take an extra 20% off your entire purchase. To receive this offer at your nearest G.H. Bass & Co. Factory Outlet Location mention code TAKE20. If you want to take an advantage of this offer online, use promo code TAKE20 at checkout. Source of the information is G.H. Bass & Co. Offer is valid until June 6, 2016. For more details visit your nearest G.H. Bass & Co. Factory Outlet Location or official website.